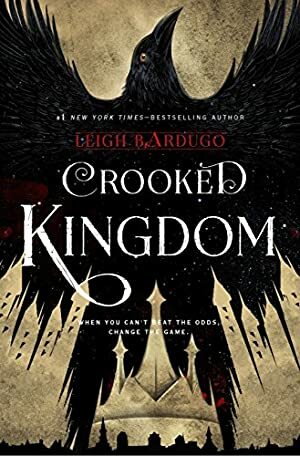 The hotly-anticipated sequel to SIX OF CROWS, this is GAME OF THRONES meets OCEAN'S ELEVEN in a fantasy epic from the number 1 NEW YORK TIMES bestselling author Leigh Bardugo. Kaz Brekker and his crew of deadly outcasts have just pulled off a heist so daring even they didn't think they'd survive. But instead of divvying up a fat reward, they're right back to fighting for their lives. Double-crossed and badly weakened, the crew is low on resources, allies, and hope. As powerful forces from around the world descend on Ketterdam to root out the secrets of the dangerous drug known as jurda parem, old rivals and new enemies emerge to challenge Kaz's cunning and test the team's fragile loyalties. A war will be waged on the city's dark and twisting streets - a battle for revenge and redemption that will decide the fate of the Grisha world. As gripping, sweeping and memorable as the Grisha trilogy - SHADOW AND BONE, SIEGE AND STORM and RUIN AND RISING - this novel is perfect for fans of Sarah J. Maas, Laini Taylor, Kristin Cashore and GAME OF THRONES. Winner of the Teen Choice Book Award for Book of the Year. Log In to track Leigh Bardugo on eReaderIQ. to be notified each time the price drops on any book by Leigh Bardugo. to stop tracking Leigh Bardugo. We started tracking this book on April 3, 2017. The price of this book has changed 3 times in the past 748 days. The current price of this book is $7.99 last checked 3 months ago. The lowest price to date was $6.99 last reached on August 7, 2017. This book has been $6.99 one time since we started tracking it. The highest price to date was $9.99 last reached on April 3, 2017. We last verified the price of this book about 3 months ago. At that time, the price was $7.99. This price is subject to change. The price displayed on the Amazon.ca website at the time of purchase is the price you will pay for this book. Please confirm the price before making any purchases.